It’s hard to say what car is destined to become an icon or classic. Unfortunately, some cars are never given the chance. Such was the case of the 1970 VW-Porsche Tapiro. What, you’ve never heard of a Porsche Tapiro? Don’t feel too bad. Unless you happened to be at the Turin Motor Show in 1970, your chances of having seen or heard of this car are very slim. Chances are, even if you haven’t heard of a Porsche Tapiro, you are still familiar with its styling (note the gullwing doors, straight, crisp lines and wedge shape). 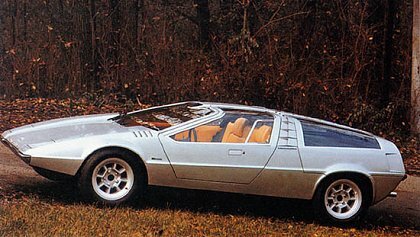 Designed by Girogetto Giurgiaro, in what was then known as the “folded paper” era of car design, most concept and production level super cars of the 1970s were influenced by this one-off prototype. Giorgetto Giugiaro is an Italian car designer who may be best known for the introduction of the “folded paper” era of car design. The name lends itself to the straight lines and sharp edges made popular on a wide variety of early ‘70s super cars conceptualized and designed by Giurgiaro (Lotus Esprit, De Lorean DMC 12, Maserati Merak, Bora and Quattroporte, BMW M1, etc. etc.). Many other manufacturers would take their design cues from Giurgiaro including Lamborghini, Ferrari, Audi, Bugatti, etc. ; the clean lines of the Porsche Tapiro being highly evident in their styling. In addition to these icons of super car class and style, Giurgiaro played lead roles in the design of some of the best selling cars ever (VW Golf and Scirocco, many Subarus, Fiats, Saabs, etc.). To say the Giurgiaro is a prolific and successful car designer would be an understatement of immense proportions. In recognition of his talent, Giurgiaro was awarded the "Car Designer of the Century" by the Global Automotive Elections Foundation (this is an international award given to the most influential car designer of the Twentieth Century). As I alluded to in the opening statement of this post, the 1970 Porsche Tapiro had a brief, but explosive existence. Introduced to the world at the 1970 Turin Motor show, the car was based on a Porsche 914/916 chassis and mechanicals. Even as a one-off prototype the car was delivered to the show as a fully operational and road-going model. Following the show, the car was purchased by a wealthy Spanish industrialist who used the car as a daily driver until the car was literally blown up by terrorists protesting its owner's labor policies. The rusted remains now call an Italian Museum home. While I’m not 100% certain, I think it is safe to say this car may have made its way into production given the other similar cars of the time (Delorean DMC, Lotus Esprit, Lancia Stratos, BMW E25 Turbo, etc.). what do you think? Were you familiar with this Porsche? Does anyone happen to know the name of the Museum where the car's remains can be found? Updated March 5, 2009: After some searching and discussions with others I was able to get more information. Read it here at Porsche Tapiro I Found It! Porsche Tapiro, I Found It! It would have been UNbelievably exciting to see something like this at the car show back in 1970. I can just imagine the sense of wonder at that time about cars of the future. This car clearly had a significant and lasting influence on supercars designed since. Reminds me of that Ferrari PF Modulo concept. I couldn’t agree more and that is one of the reasons I enjoy attending car shows today. You just never know what you are going to see. As a side note I was able to track down the location of the car and actually received additional pictures directly from the manufacturer. I will be posting those in a follow-up article. I saw this car at the first auto show that I ever attended. I believe it was at the Los Angeles Auto Show of 1971. It held up well against the Pininfarina Modulo and Bertone’s Lancia Stratos (concept not production car). I thought that it looked every bit as exotic but looked more believable as a car that one could actually drive on a daily basis. That’s pretty interesting. I imagine it would be pretty hard to mistake the Tapiro for something else. The research that I did showed the car went into private hands immediately following the show at Turin. If you are correct, which I have no reason to doubt, that changes the history of the car some what. I had read somewhere that the car had indeed been sold to a private party eventually. As for it’s being in the the 1971 L.A. Auto Show, a couple of years ago while packing up for a move came across the printed program / catalogue of the show that featured the car on it’s cover. This car along with the 917’s were the cars that eventually turned me into a Porschephile. That’s fantastic. If you happen to come across that program again, any chance of scanning it in and sending it to me? I have a great picture that the people at Giugiaro SPA gave me showing the car as it arrived back to them, following the explosion. I will be posting that in a few weeks as a follow-up to the original article. It’s a bit faded and a little worse for wear but I’ll try to locate it among my many boxes of unpacked printed material. I do have the capability to scan it and will send you a scan as soon as I get a chance to do so. That’s very interesting Ben. Looks like you have quite a good memory still of that first car show. Looking forward to seeing a scan of that program cover. Must be neat to flip through those pages so many years later and see how far the car industry has come. I get a kick out of flipping through an old car magazine and seeing the old ads and reviews. Good time capsule type stuff! LOVE the chick in the leopard bikini! Those are classic 1970s ads. I think it’s time to consider female Porsche owners. From now on Porsche should hire David Beckham or Patrick Dempsey and pose them in speedos next to 997s. It sure would make me love my car even more! No one, and I mean no one, looks good in a speedo! I’m comfortable enough with myself to agree that Beckham is a good looking guy, but Dempsey? Come on. The only thing he has going for him is that he’s a Porsche guy and the many re-runs of “Can’t Buy Me Love”. I thought you were going to offer up some posts on Porsche from the female perspective? God knows I’ll never get us to that point. Porsche!Is a very specific car. I cannot condemn its styling in a early 70s context, but as for today, I must comment, ugly like delorean. The date is 15th July 2009….I have just come back from shopping at Sainsbury’s in the UK…While the wife does the shopping I read the magazines! Tonight is the first time I have seen this car in a small article in one of the “lad’s mags” it was either NUTS or ZOO magazine or maybe Practical motoring(about old cars) just inside the front cover.I fell in love with this car and had to find out more.On one site people are saying they do not know which museum this car is in,well it tells you in the magazine…..I can’t remember it’s name ,something like Geuges Museum.Hope this helps? 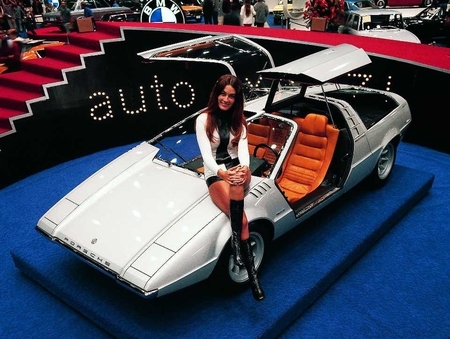 Stunning car ahead of it’s time,agree with others that DeLorean ripped off the styling….but made a crap job at copying it……putting an Allegro engine in the DeLorean was an insult to porsche design. I’m glad you liked the post so much as well as the Tapiro. Since I wrote this, I actually located the car and wrote a post about it. Thanks for reminding me to link them together!!! 🙂 Here’s a link for you.. Regarding Tapiro vs DeLorean: No, the DeLorean is not a design rip-off. It was design by the same man/company Giorgetto Giugiaro/Ital Design as the Tapiro. 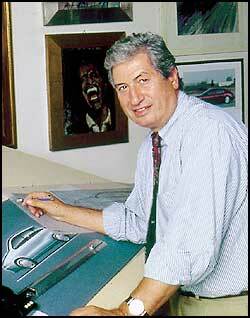 Giugiaro seems to be the designer of his era that perfected the “planar/angular” school of design. Having said that, I do prefer the design of the Tapiro because it has far better proportions than the DeLorean. The only other designs that he did in that time frame that I hold in equal esteem (also because of proportions) are the Maserati Boomerang and the original Lotus Esprit Concept car. The Tapiro was a beautiful rendition of clean-but-boxy 1970’s sports car styling. Too bad it was trashed. Calling it a Porsche was stretching things too much, even if the pan and drive train came from the 914/6 family. In my view, a Porsche should me immediately recognized as such (at least by porschephiles), as well as provide a Porsche driving experience, which is unique among sports cars. Cramming a Porsche drive train in anything, pretty or not, doth not a Porsche make, any more than does stuffing a Chevy 350 V-8 in the rear seat of a 911. T’aint no Porsche. I hate professional writers that don’t proofread and make glaring errors within the first couple of sentences. It makes me doubt the credibility of everything they say afterward…and this looked like such an interesting article. An ugly Delorean??? I love that look. I wish they would bring the gull wing design back. This is a retro futuristic looking car. I wonder if it never saw production because of how close it looks to the DeTomaso Mangusta. The Mangusta was also designed by Giorgetto Giugiaro and went into production in 1967. Was the concept shown at Turin by Porsche or by Giugiaro? He has shown other concepts himself. I can see Porshe being unhappy with Giugiaro for basing the car on one of his existing designs that was in production for another manufacturer. It was said that the 1974 Hyundai Pony Coupe, was the inspiration for the Delorean DM2 (according to Italdesign). It would seem the Hyundai Pony Coupe got it’s inspiration from the Tapiro. Does anyone know what happened to this car? Is it with Hyundai or with Italdesign?